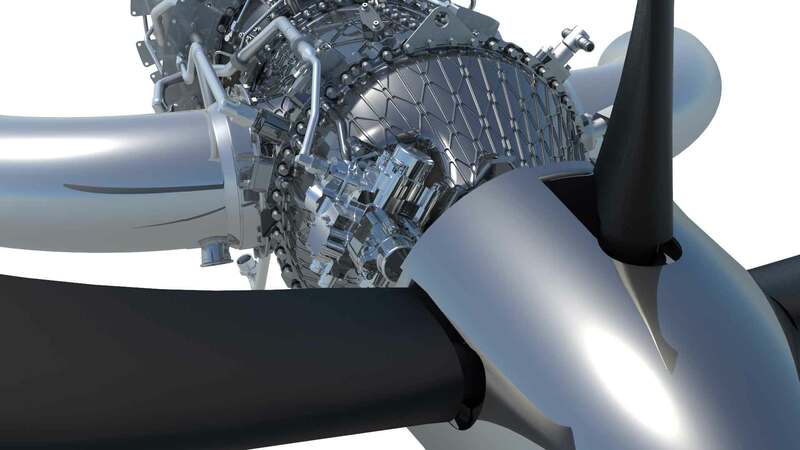 GE Aviation’s Advanced Turboprop (ATP), the first clean-sheet turboprop engine to hit the Business and General Aviation (BGA) market in more than 30 years, is on the brink of its first engine run by the end of the year at the GE Aviation Czech facility in Prague. Test cells have been upgraded at the GE Aviation Czech facility, where the team is assembling and preparing the engine. All the additive parts have been printed for the engine and about 85 percent of the components are already in Prague, with the rest coming soon. Meanwhile, in Munich, Germany, GE engineers are conducting the ATP’s most significant tests to date — Axial-Centrifugal Compressor Vehicle (ACCV) tests — at GE’s European Technology Center. The ATP’s stator, rotor, and cold section assemblies produce the ACCV test vehicle. More than 700 instrument gauges are hooked up to the vehicle so GE engineers can fully understand the ATP’s compressor design and validate efficiency, performance, and operability. “Our engineering group is optimistic that the performance numbers that we quoted for ATP will be met or exceeded,” Mottier said. The 1,240SHP-rated ATP is the first entry in GE’s new family of turboprop engines aimed at BGA aircraft in the 1,000-1,600 SHP range. The ATP features an industry-best 16:1 overall pressure ratio, enabling the engine to achieve as much as 20 percent lower fuel burn and 10 percent higher cruise power compared to competitor offerings in the same size class. At 4,000 hours, ATP offers 33 percent more time between overhaul than its leading competitor. Mottier unveiled the ATP engine at the National Business Aviation Association (NBAA) Convention in November of 2015 and announced the engine was chosen to power another clean-sheet design, the new Cessna Denali. GE Aviation has committed more than $400 million in development costs and invested more than $1 billion to develop additive manufacturing capabilities. The ATP includes more printed components than any production engine in aviation history with 35 percent of the turboprop’s parts built via additive manufacturing. A total of 855 conventionally manufactured parts has been reduced to 12 additive parts, including sumps, bearing housings, frames, exhaust case, combustor liner, heat exchangers and stationary flow path components. Additive components reduce the ATP’s weight by 5 percent while contributing a 1 percent improvement in specific fuel consumption (SFC). All printed parts have been printed for the first engine to test. It is the first turboprop engine in its class to introduce two stages of variable stator vanes and cooled high-pressure turbine blades, proven technologies developed by GE in its large commercial engines and flown more than 1.3 billion flight hours. With the use of advanced 3-dimensional aerodynamics, improved materials, and cooled turbine technologies, the ATP engine will deliver significantly higher efficiency, as well as greater performance and durability than other engines in its class. The ATP’s Integrated Propulsion Control (IPC) system enables the engine to operate at its optimum capability. The engine features a single lever and a Full Authority Digital Engine Control (FADEC) system, the first of its kind in the BGA turboprop market. ATP’s FADEC system will optimize the speed of the propeller versus the engine around the envelope to get better performance, better power during climb and takeoff, and better efficiency at cruise. The IPC significantly reduces pilot workload and enables the pilot to focus on other aspects of flying the aircraft. ATP also features a digital twin as a service tool to provide predictive maintenance. The IPC will collect performance data to run a simulation of the flight and compare the data to other engines in the fleet to see how the targeted engine is performing. The first ATP engine is expected to begin flight tests on the Cessna Denali next year and complete certification in 2020.